Blast down the Clearwater River in a tandem whitewater raft and experience the thrills and excitement of BC's best three-hour whitewater adventure. Whether you are by yourself or with a companion, experience this amazing river in Wells Gray Park. In July and August these are our most popular trips full of big splashes and a true sense of accomplishment. 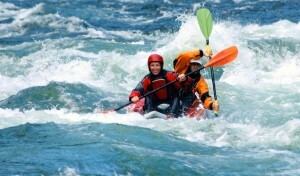 Why ride in a traditional white water raft when you can paddle your very own tandem whitewater raft?